Many of our purchasing clients are first-time buyers, and we take an extra measure of pleasure preparing them to be discerning buyers, making sound, well-informed decisions. Many of our clients selling property are offering a residence that could sell for much more with a few updates, and for them we provide access to our extensive network of tried and tested contractors and specialized tradesmen. 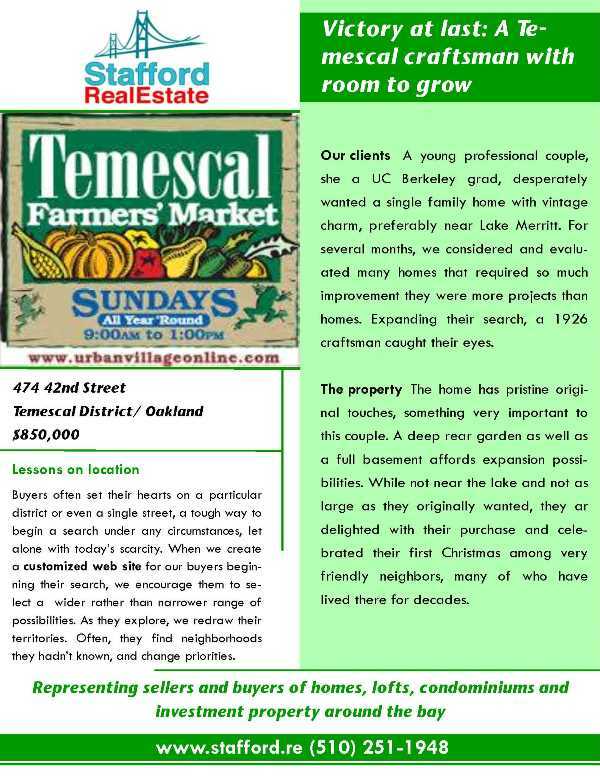 Because we know what buyers want, we help sellers make only smart investments that will return the investment. And we enrich our service through our extensive experience and network. We are broker-realtor Barry Pilger and realtor partner Catherine Moss. With our real estate transaction expertise, we offer personal experience as buyers and sellers of more than 30 pieces of real estate, as builders of three of our own homes and as general contractors and mortgage brokers. That's first-hand, invaluable experience we share generously with our clients. Catherine's maternal family arrived in San Francisco in 1860,her father was born and raised in Oakland. Barry moved to Oakland in 1973. Together, we remain deeply engaged in commercial, civic, social and cultural life. As our business grows, we welcome associates. Pat Brennan, a long time Realtor broker. Josh Rosenberg, Oakland native and customer service professional, who also has a construction background, joined us in 2014. Our clients re-engage us when their lives and needs transform. They recommend us to their families and friends. As a result, our practice now has roots in every sort of residence, from hip lofts and condos to luxurious homes, in practically every community around the bay. 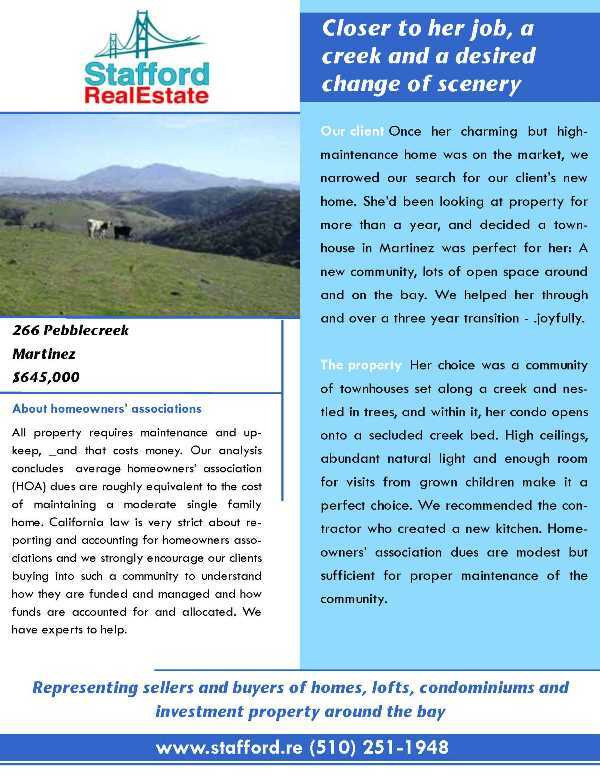 Our clients' stories are lively and fresh from the front, and offer heartwarming and colorful tales of real people now happily nested in real homes. You can read them by clicking 'Home at Last' at the top of this page. Many of our clients are first-time homebuyers, and our goal is to make them very, very smart homeowners. We offer our clients highly practical experience and expertise in every phase of the home buying process, from evaluating quality of the investment to assessing stability of foundations and roofs. Financing. Our mortgage partners offer exceptional service, highly competitive terms and always but always perform and exceed expectations. Home inspections and home warranties. > Experience in making successful offers and signing contracts. > Trained in negotiation techniques, we take negotiating on behalf of our clients very seriously. California Association of Realtors accepted forms and processes are increasingly complex. 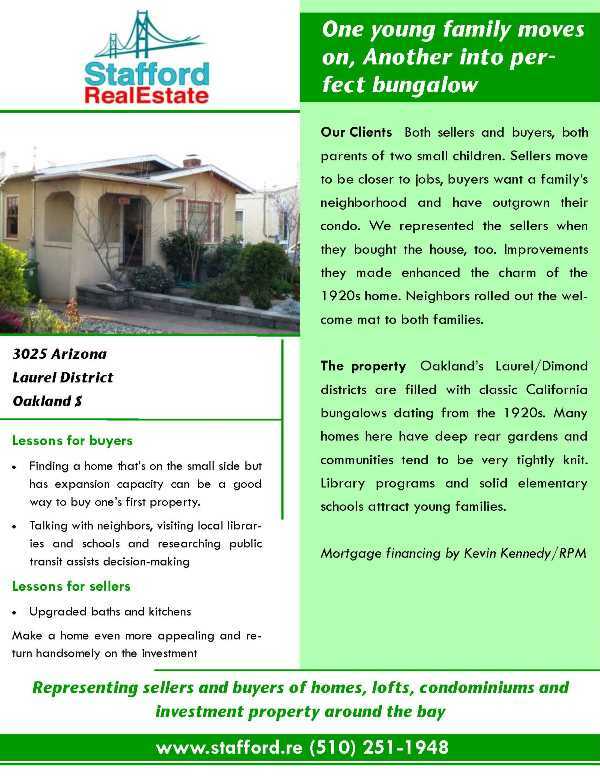 Barry knows them so well he even teachers courses to other realtors. Having a properly funded reserve is critical for a successfully operated homeowners association. Referrals to tried and tested contractors, from painters to plumbers. Our ties to the construction community remain strong and our experience current. From knowing how to work with city departments to sleuthing a neighborhood's safety record, our resources are invaluable. Tax deferred exchanges: We have an experienced team to help clients undertaking a 1031 exchange. Federal law provides for an investor to sell a property, reinvest the proceeds in a new property and defer all capital gains but timing as well as engagement of an experienced intermediary is critical to making this a success. A word about searching for properties. 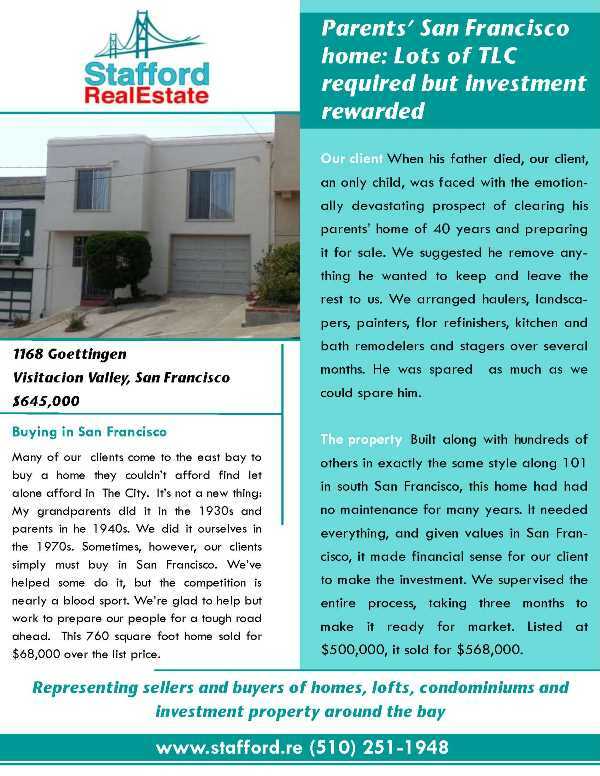 Remember that sites like Zillow.com and Trulia.com do not have ALL the listing in the Bay Area neighborhood you are searching. Only Realtor.com has them. 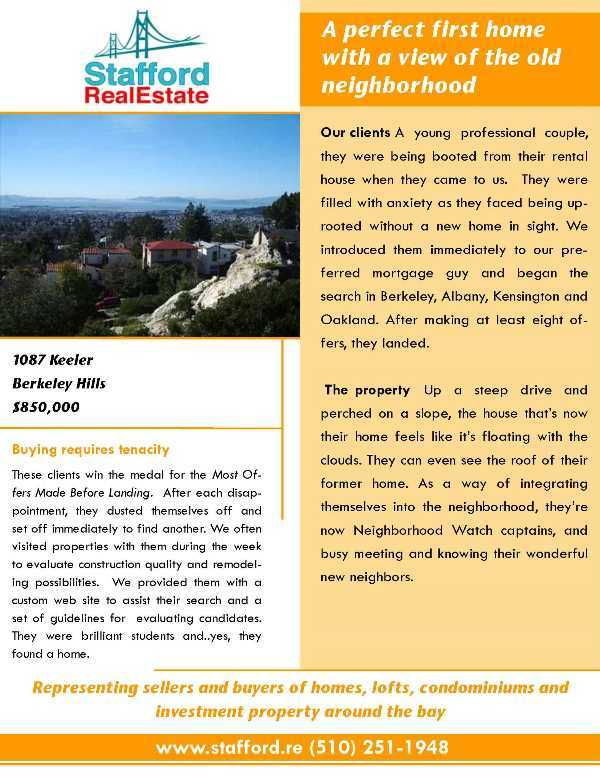 Our advice is to rely strictly on Realtor.com for your searching. It is the most accurate and most current. Even in a sellers' market such as this, efforts to maximize a home's value considerable dividends. Updating can return up to four fold on an investment. Pricing a property properly can make a difference between a high price with multiple offers to no offers and a property perceived as damaged goods. Sometimes, our selling clients are best served by a private sale, eliminating the inconveniences of remodeling and open houses. We do those, too, for benefit of both parties in the transaction. 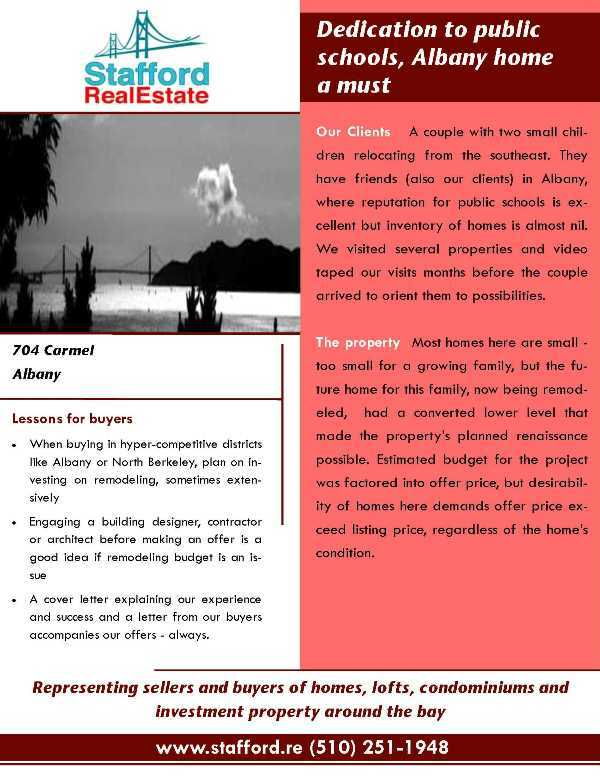 With years of representing dozens upon dozens of sellers and buyers, we know how to best serve the goals of our sellers, and we know how buyers look and see. 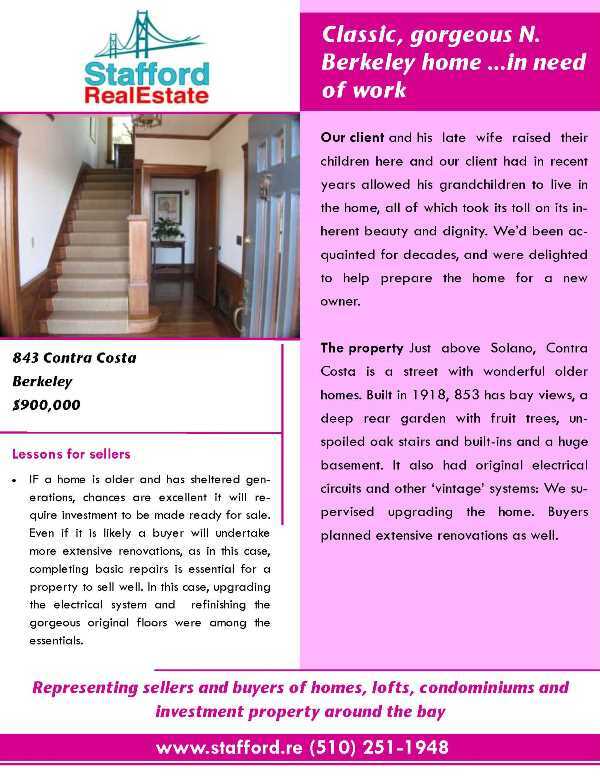 What better expertise could we offer a seller? Tax deferred exchange: We have an experienced team to help clients undertaking a 1031 exchange. Federal law provides for an investor to sell a property, reinvest the proceeds in a new property and defer all capital gains but timing as well as engagement of an experienced intermediary is critical to making this a success. We called Barry at home on a Saturday morning to ask his help with a mortgage for a condominium we found on our own. As he asked a few questions about the transaction and the role we wanted him to play, we realized that we wanted  and needed  all of his expertise, both as a Realtor  and as mortgage broker. He dropped everything and met us in his office that day. Barry negotiated hard for us, but in the end we walked away. We knew the unit was over-priced, based on the research he provided. By Thursday of the following week, we were in contract for another condo we wanted. This time in the Sierra. Within a month we were living there. His advice about how to find, evaluate, negotiate and finance our condominium was incredibly helpful. Barry's experience with all aspects of the process made it simple for us. There were no surprises. We recommend him to all our friends and wouldn't dream of calling anyone else when we're ready to buy our next home. Meeting Catherine and Barry was the best thing that has happened to my real estate investing career. They put me into a fantastic condo in the Jack London District. I paid the lowest price per square foot ever paid in the building where my loft is located. 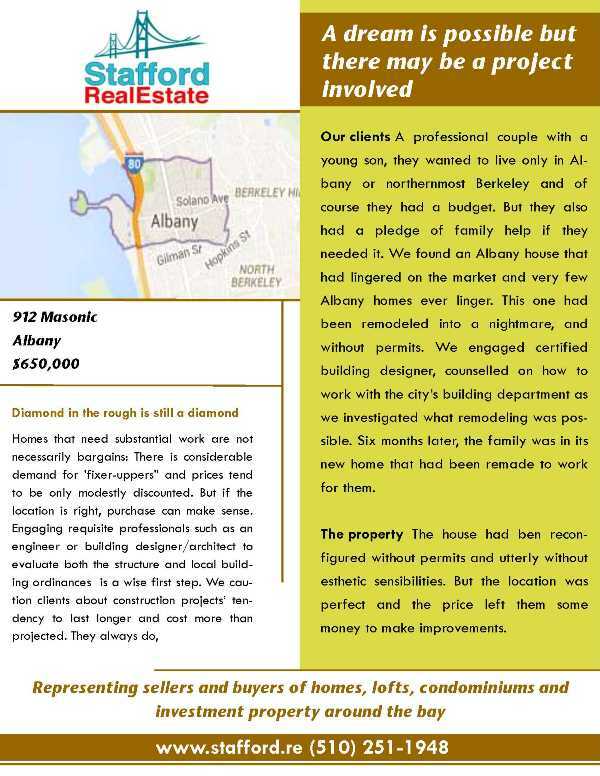 When we started our search for a condo in downtown Oakland we had no idea where to start. 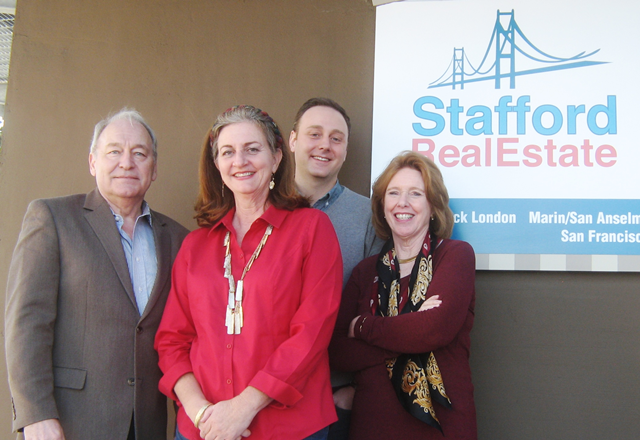 We found Stafford Real Estate on the web and joined several of their Sunday tours. On our third Sunday we found the condo we eventually purchased. It had never been held open. Because of Stafford Real Estate's Sunday tours we got the deal of a lifetime. Dealing with Stafford Real Estate is a pleasure. I met Barry and Catherine when I was contemplating moving into the Jack London Square neighborhood as a renter. They were knowledgeable, affable, and welcoming. 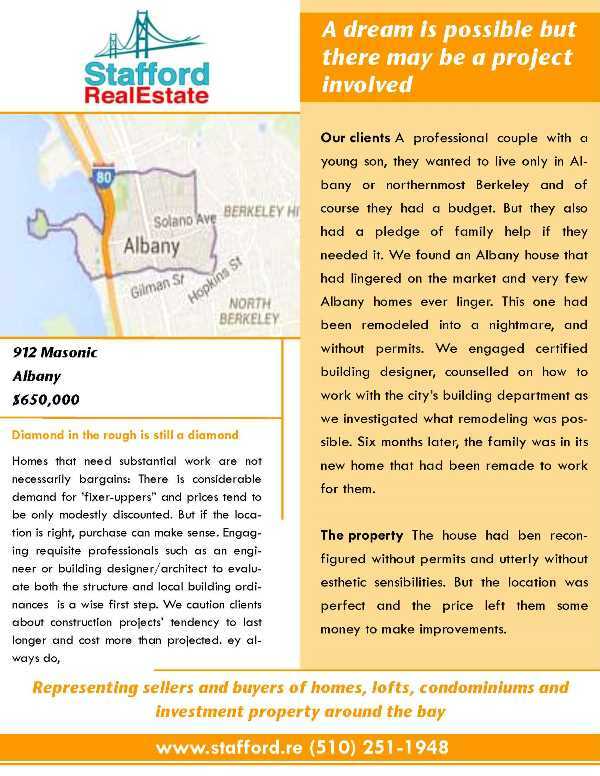 After a year as a renter, I worked with Barry, surveying available inventory, pricing, available financing and trends. I decided to become a buyer. I particularly appreciated his acute insights into the neighborhood real estate market and the larger mortgage market. They were not just looking to make a sale; they were partners in crafting approaches both to the seller and potential sources of financing. After finding the right unit in The Sierra, I made a below asking price offer that was intended to get a prompt, positive response. 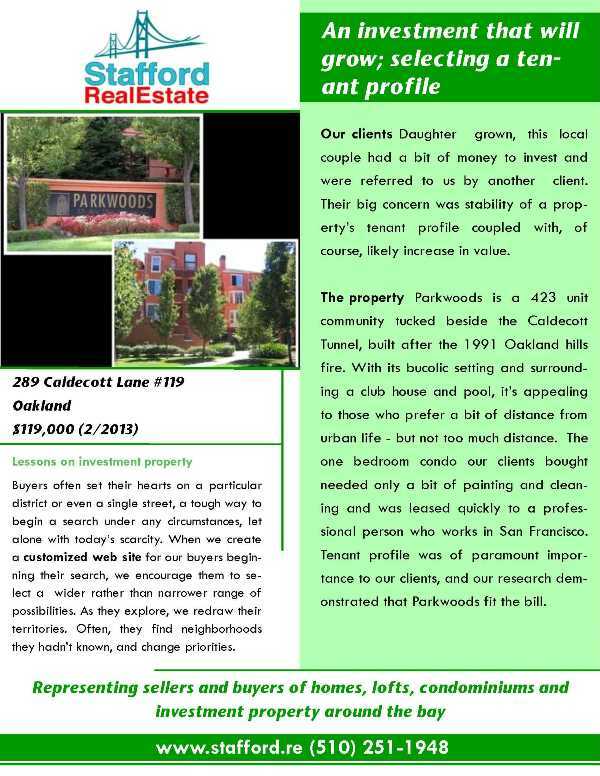 From the date of the offer to the close of escrow was 28 days! It would not have happened without Stafford. I recommend them without reservation. 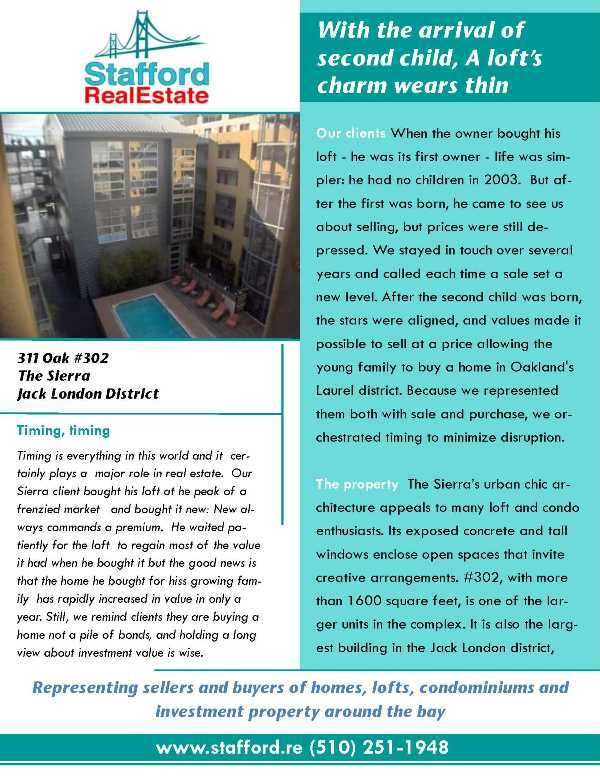 I wanted very much to live in the Jack London District: It is friendly, convenient to the Oakland Airport I travel frequently and I was longing for a water view.I found Barry and Catherine and Stafford Real Estate on the web and joined one of their Sunday tours of Jack London. The tour gave me exactly what I was hoping for: A look at many of the buildings in the district, a solid understanding of the prices and options and most important a feeling of confidence that Barry and Catherine knew what they were doing, were total professionals and a delight to work with. When I found the property I wanted, it happened to be owned by the bank and the real journey began. I still don't know how they managed to satisfy all the requirements the bank imposed, but they did after weeks and weeks of work. They communicated perfectly with me as I travelled around the country and even when visiting my home in New Zealand and finally the deal came together. I'm a licensed real estate agent, and I never would have attempted to navigate the wilds of negotiating for a distressed property. I am so impressed with what and how much they know and how they took care of both the transaction - and me - during the arduous process. They never allowed me to lose faith and I simply love my new home. They even recommended a painter and seem to have a resource for everything I need. And I often go by just to visit: I feel like part of the family now. As first- time home buyers, we were nervous, excited and novices. The first time we met with Catherine and Barry, those unsteady and nervous feelings started to disappear; we knew we were in good hands. No matter how many questions, homes or addresses we sent their way, they always replied with answers and flexible when it came to viewing homes. Catherine and Barry assisted us and stood behind our decisions every step in the process. When we were unsure of our knowledge, they always gave us their opinion based on facts but they also assured us and stood behind our decisions. This has been the best first-time home purchase experience we could have ever hoped. Not only do we feel that we have a great rapport with Catherine and Barry, we have also adopted a few of their "guys" for future work on our new home. We will definitely work with Catherine and Barry when we decide to purchase another home and we will always recommend them to our friends. We had met a few agents before meeting Barry and Catherine in the very first tour of Jack London properties. 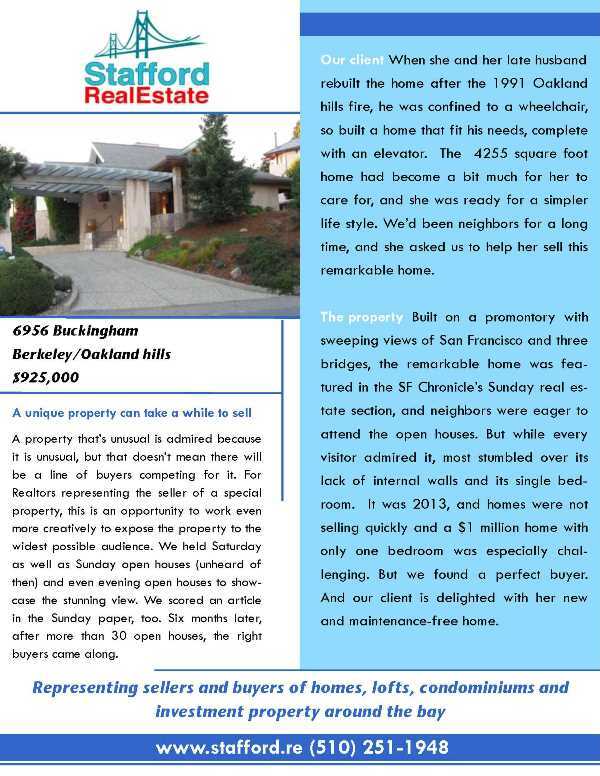 And it became clear immediately that Barry has more experience and deeper insights in the area, as well as real estate and mortgages in general, than any other agents we have met. 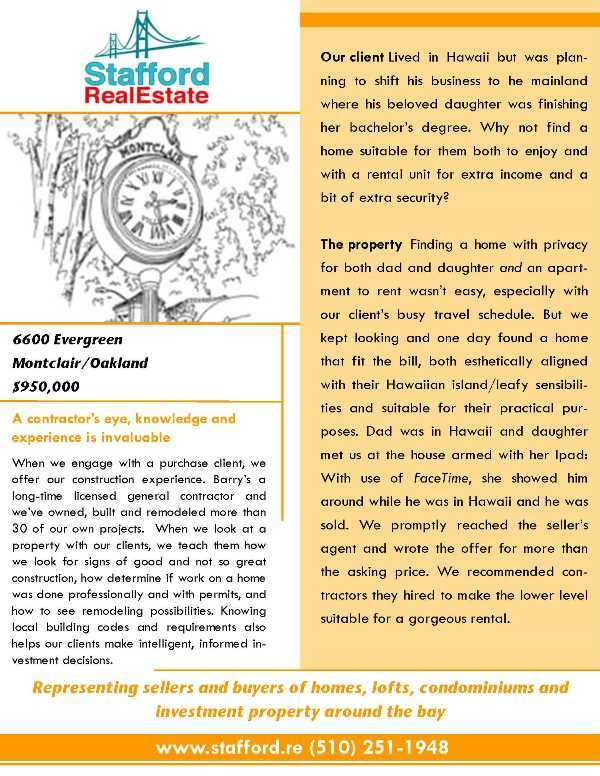 This was our first home purchase, and Barry took time to clearly explain and guide us into getting a favorable deal. Barry, with his knowledge and experience, and Catherine, with her personal touches and genuine caring of her clients, they make an awesome dynamic duo of agents! It has been absolute delight working with them, and I would not hesitate one bit to work with them again in the future. Our company is in the direct mail business and we needed a bigger space to manage our rapid growth. Although I'm a real estate broker myself, I didn't have time to manage my own transaction. So I turned to Barry for his help and expertise. We found a warehouse that suited us and Barry went to work - arranging inspections, talking with the city about construction issues and working with the owners' representative. 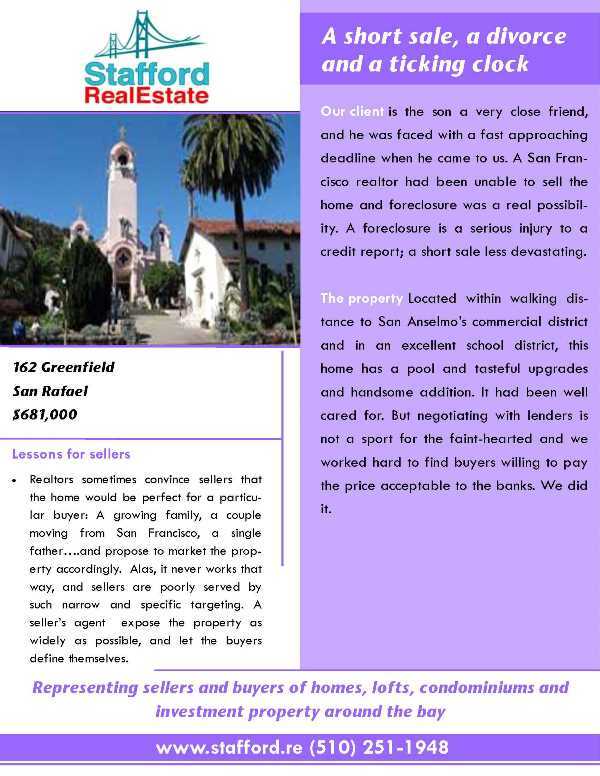 When Barry sensed that the seller might delay the close of escrow he got them to agree to a mandatory price reduction if closing took place later than a certain date. And sure enough, the sellers delayed and purchase price was reduced. The transaction dragged on for weeks. but Barry never gave up. When we thought there was no chance, Barry kept at it. A few months later, the transaction finalized. Asking Barry's help was one of the smartest business decisions I have ever made. We met Barry through a mutual friend. At our first meeting, Barry laid out a plan that would correct some gaps in our credit reports so we could qualify for the best financing available. We set out on that plan. Several months later and thanks to Barry's advice, we had perfect credit. We began our home search when we were expecting our first child and very eager to find a home of our own before the baby came. Barry first arranged great financing for us and then helped us decide exactly what we wanted, what we could afford and where we wanted to live. We thought we wanted to live in one town, and he found and arranged for us to see several houses there that met our criteria. But then we changed our minds and decided on another town. And then another change. We were so apologetic for taking so much time. "This is what I do," he always said. Finally, we found something we really wanted and he arranged all the inspections for us. He even met us at our doctor's office one afternoon to collect signatures. Our baby is walking now, and we are very happy with our home, our community and think so often of how extraordinarily helpful Barry was in making it all happen for us. We've known Barry for many years, and when we decided to sell our hundred year old Craftsman and move our family to Marin, we asked him how he would proceed. We also talked with an agent from the area's largest and most prestigious firm. During those weeks before the house went on the market, and while we were preparing it, remodeling the home we were moving to and preparing the move itself, Barry arranged for everything we asked for and more. He found plumbers, painters, furniture refinishers, auction houses, landscapers, people to furnish the home for viewing, and a man who made a custom carpet in a week. He forwarded mail, did a number of crucial repairs himself, and kept our old neighbors happy and calm. The brochure and flyer they had designed for the house were gorgeous, and they even got the Daily Planet to write an article about the house and its architect. Once it was on the market, he and his wife Catherine invited neighbors in for a twilight wine reception, watered the garden, fed the fish in the pond, kept the house dusted, and held it open every Sunday until it sold. It sold to the perfect family within three weeks for more than the asking price. We never would have made it without him and can't imagine anyone else who could do so much for us and see us through to a successful sale so ably and compassionately. We were living in The City and had never owned a home but we had two little boys and one more on the way. A colleague suggested we call Barry for help. 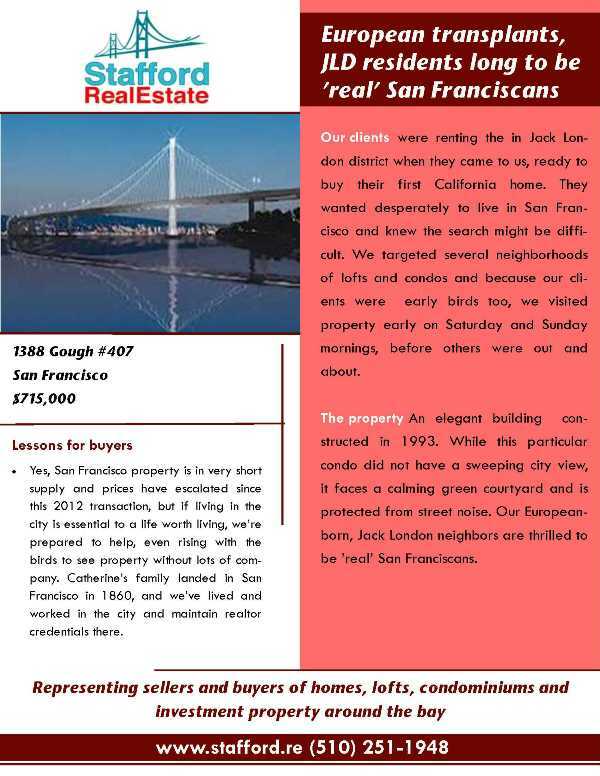 At first we thought we wanted to stay in San Francisco and found a condominium we liked. 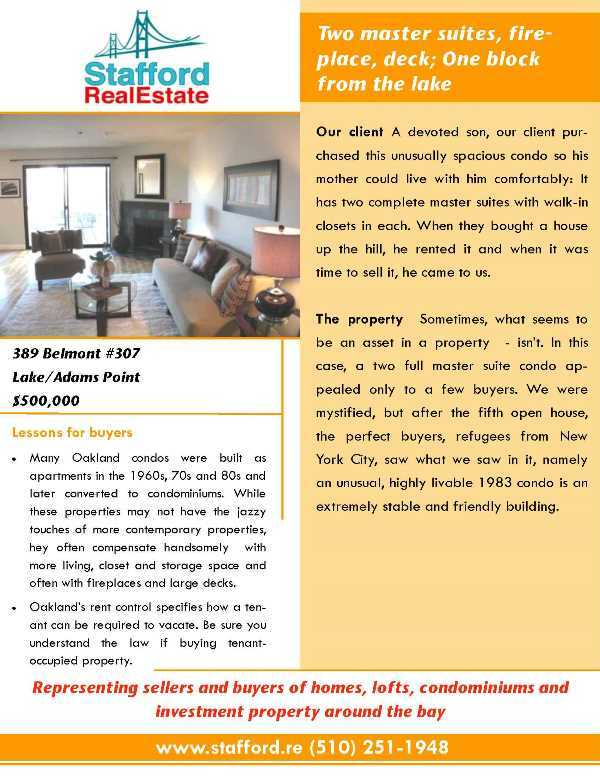 Barry explained the pros and cons of the condo, and we decided to look for a house instead, but outside the city to stay within our budget. So there we were two little boys trailing along, both of us taking time off our jobs, the new baby only a couple months away. He organized financing so we could compete successfully in what was a hot market. 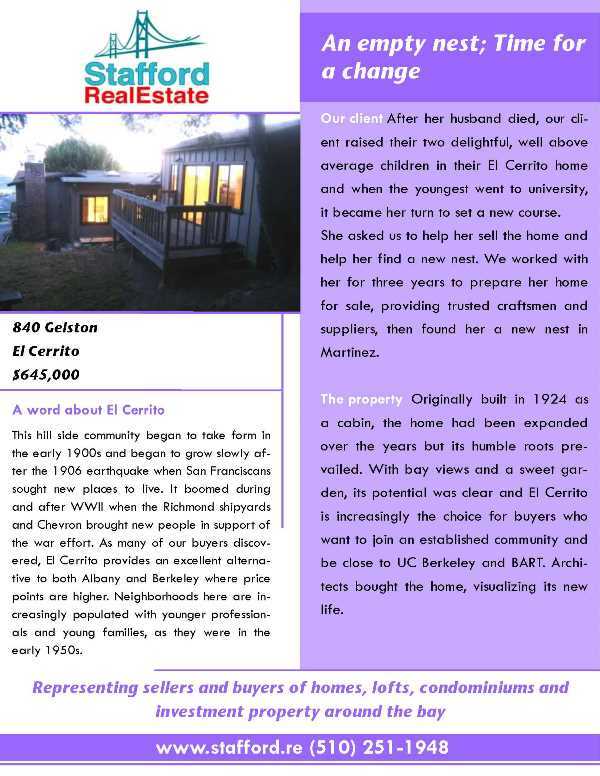 When we found the El Cerrito neighborhood and house we wanted, he arranged everything even the plumbers and electricians who found an inexpensive way to install a laundry. He and Catherine, his wife, even brought us dinner the night we moved in! Every step of the way, we felt completely cared for, completely confident that someone as smart as he is was looking out for our interests. And now we're a family of five in our new home! 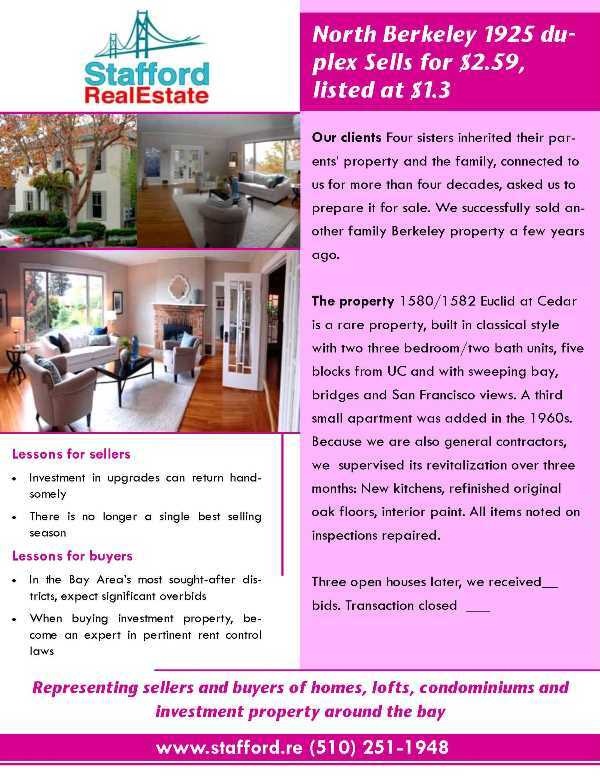 My ex-wife and I had a little house in Berkeley we'd remodeled, and we needed to sell it quickly. When Barry came to see the property, he suggested we make a number of improvements, and while he was correct, we were short of time, energy and cash. He provided us with the most amazing team of tradesmen to help prepare the house: Painters, carpenters, plumbers, landscapers and they all worked with us to accept payment after sale. He even put on a tool belt a few times and pitched in himself! The house sold within a few weeks for more than we were asking. Now we can both get on with our lives. There was absolutely nothing more Barry could have done for us than he did. 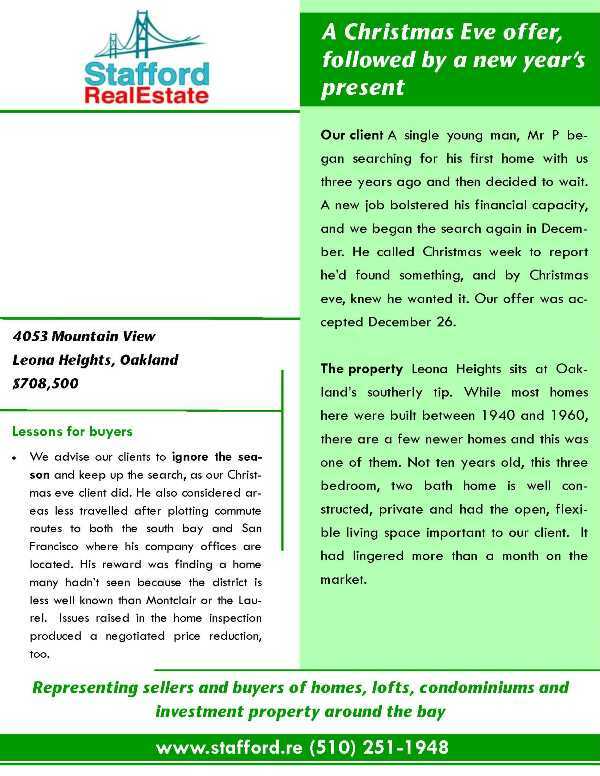 I don't think any other real estate person would be so incredibly helpful and resourceful. We recommend him to everyone we know. We manage property and have done so for decades. We have managed 30 investment properties of our own and currently manage more than 20 units. Our clients are happy. Our tenants are happy. And we like doing this. We have staff capacity to manage more. Maintenance $80/hour billed in ¼ hour increments. We handle most routine maintenance with our own licensed crew. Our sister company, Stafford Structural and Remodeling, is licensed as a general contractor by the California State Contractor Licensing Board. You can check us out on the state’s website under license #739331. 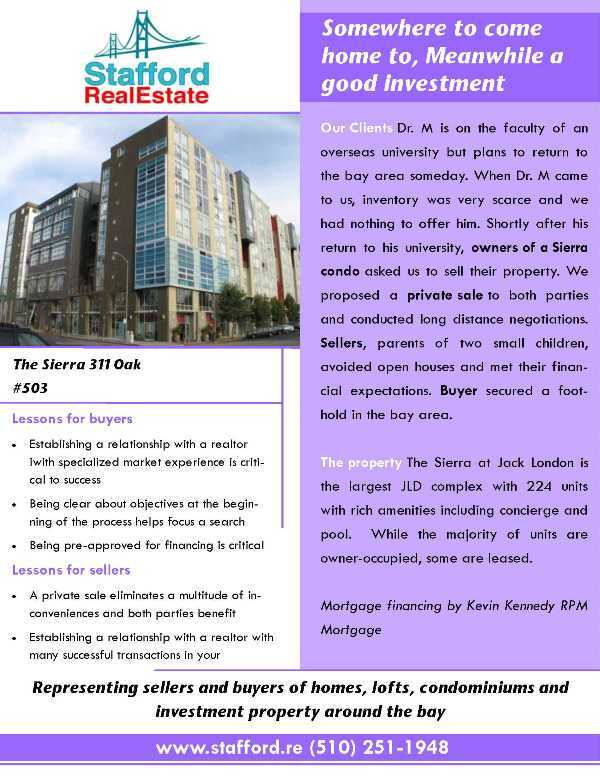 >> My relationship with Stafford Real Estate spans over a decade. I first moved into a rental unit in The Sierra in 2008. I then met Barry and Catherine in the ‘hood. A year later, they repented me in the purchase of a nearby unit in The Sierra. It was then that I began to further appreciate their professionalism, consistent warmth, and general savviness about the market, locally and regionally. In 2018 I decided to rent my unit and to have the unit professionally managed. There was no question that Barry and Catherine would be the first people I spoke with. They told me about their property management practice, and I was ready to sign up, even before knowing how they would be compensated! They did a heroic job of updating the loft for rental in their typical thoughtful and hands-on way. 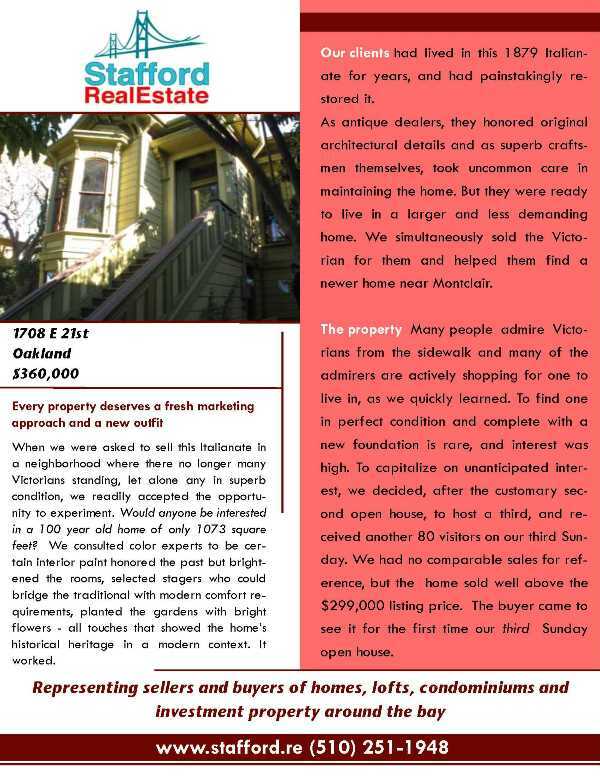 The time from list to contract with a highly qualified buyer was very short. I now am confident that owning this rental unit is now headache-free. 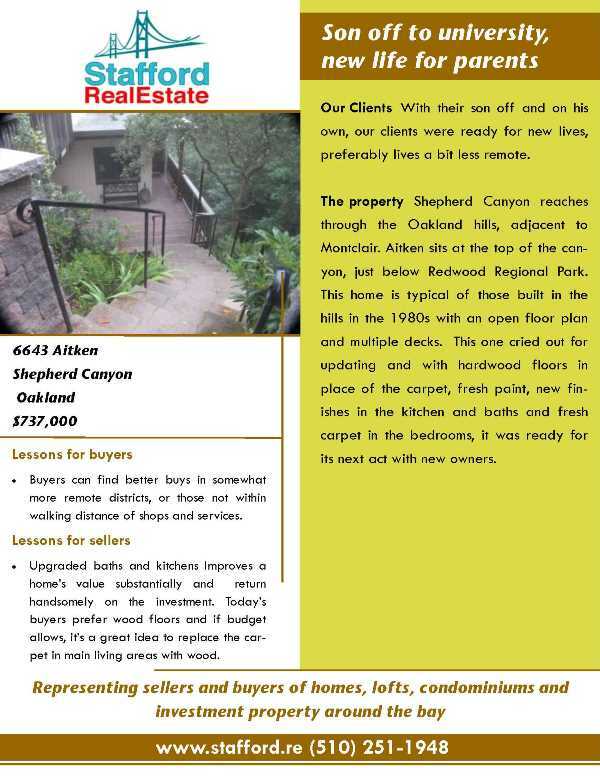 >>Should anyone want to know, in 2011-2012 we were attempting to diversify our portfolio by acquiring additional rental properties. Friends referred us to your company, and we have been delighted with the results. 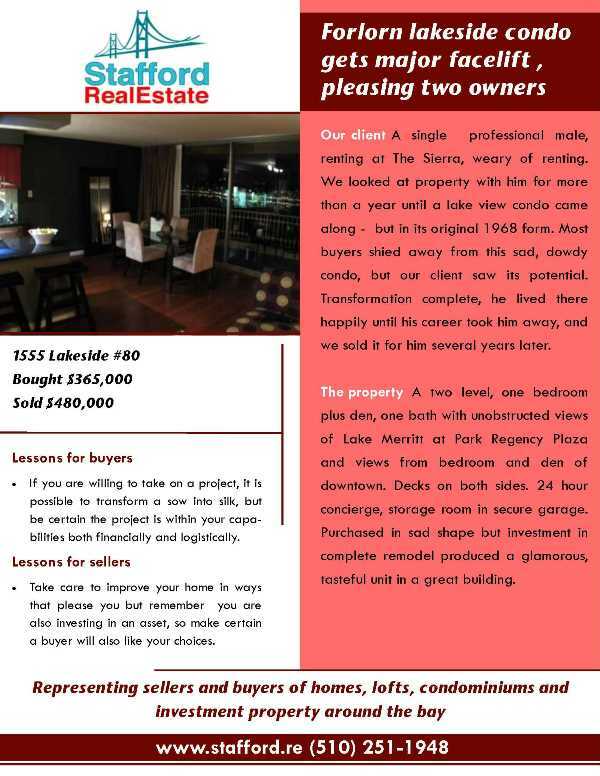 You quickly found two properties in the price range we were seeking and negotiated the sale quickly and without a hitch.